There is no denying that the top of the water column, where sunlight driving photosynthesis is strongest, provides the most nutrient-rich environment for the grow-out of your oysters. In fact, a Sea Grant Marine Extension Bulletin study published in May 2014 (https://web.whoi.edu/seagrant/wp-content/uploads/sites/24/2015/01/Oyster_Grow_FINAL_185504.pdf ) confirmed lower mortality and accelerated production rates for oysters grown in floating gear vs. bottom culture. For years growers have battled for use of the water column and floating-gear rights, trying oyster culture in floating bags, trays, buoyed lantern nets, and multi-bag cage systems. Imported multi-bag cage floats have been around for years, but now a second-generation floating system is available, designed and made in the USA. With a radically different design and patent-pending features, this new self-cleaning surface gear is easy to use and can increase profitability. In coming up with this new system, designers relied heavily on listening to input from folks in the field who had used thousands of the first-generation floats. These folks are some of leading first-tier growers, intimately familiar with the working advantages, as well as the inherent flaws, of the older designs in the real world of aquaculture on their farms. With this expert input, the new design was fleshed out, improving the performance and efficiency of the multi-bag, floating-cage system. If you’re not familiar with the design, the multi-bag floating system looks like a small pontoon boat with a vinyl-coated wire-mesh cage designed to hold multiple oyster bags attached to two floats. When this pontoon boat is “capsized” the floats hold the oysters in the cages a few inches below the surface. When flipped with the floats underneath, the cage is raised above the water allowing air and sunlight to kill off the secondary spat and bio-fouling on the cage, maximizing the flow of nutrient-rich water to the animals. Growers using first-generation floating cages have expressed a lot of frustration making repairs to damaged floats, which are permanently attached to the cages with clipped-on, single-wire strands, making it impossible to change out bad floats on the water. The offending cage has to be disconnected from the line, loaded onto the skiff, and brought ashore, keeping it out of production until repairs can be completed. But the state-of-the art design from Ketcham’s has a patent-pending system that allows removal and replacement of floats, even on the water, in a few minutes. Bob Boardman at Tarkhill Aquaculture pointed out another unexpected benefit. If the cages need to be sunk to avoid damage to the crop in the face of hurricanes or cold weather, it is no longer necessary to flood the floats – just use the quick-release feature to detach the floats. When it’s time to raise the cages again, it’s much easier without the additional weight of water-filled floats. At Virginia’s Cherrystone Aqua Farms, Tim Rapine feels the extra flotation and wider positioning of the floats on the cage in the updated design is key for his operation. Cages with the floats moved out to the edges are more stable when flipped into the de-fouling position, and the complete cage, regardless of load, is always buoyed well clear of the water. Tim has chosen to receive his FLOW N GROW™ units as prefabricated kits for in-house final assembly at his Eastern Shore facility. Growers in more exposed locations have had problems with the flexing of the single strand attachment design of the old imports. Repeated flexing from relentless sea action can fatigue these single strands to the point of failure. Super-duty, 8 1/2-gauge, marine-grade, welded wire mesh, the same stuff used in the time-tested cages, has been used in the new design as an attachment mechanism that is rugged, much stronger, simple, and effective on the water. Ketcham Supply in New Bedford, Mass., is launching this enhanced new grow-out design after nearly a year of engineering and guidance from growers in the field. The new FLOW N GROW™ is available to suit the needs of the industry as floats, kits or finished units. The folks at Ketcham’s have learned through long experience not to force customers into “a system,” as each grant, grower and farm is unique, with different individual needs and site-related challenges. Over the past eight or 10 years no one else has come close to supplying a fraction of these floating oyster-growing factories as Ketcham’s. Every month numerous tractor-trailer loads leave New Bedford for points up and down the entire East Coast. 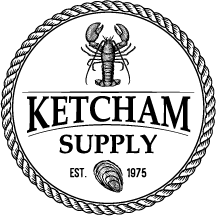 Now with this newest innovation, Ketcham’s will certainly continue to provide strong support for the shellfish aquaculture industry for years to come.